So let’s get started with a comparison between the two. 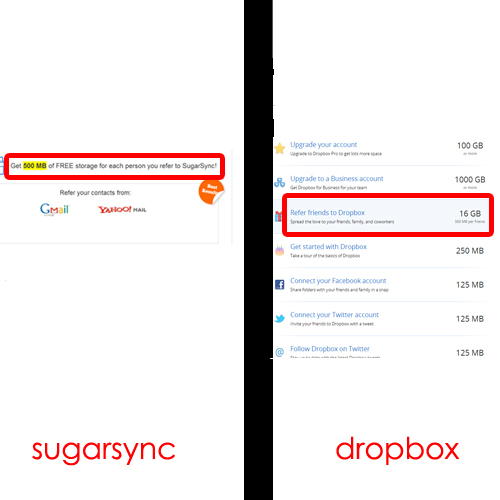 Sugarsync beats dropbox by a long margin when it comes to the size offered on a new free account sign up. Sugarsync gives more free storage when compared with Dropbox. 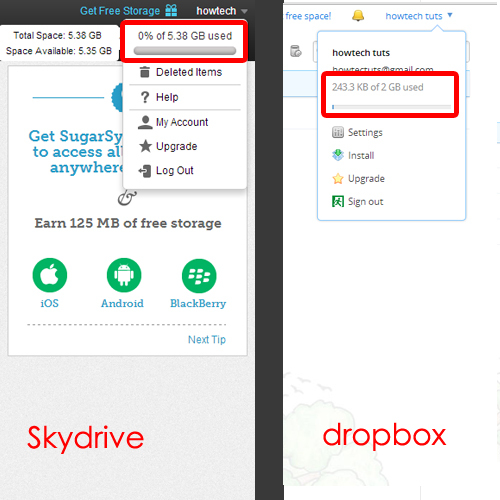 Free accounts in Sugarsync offer 5 GB of space while Dropbox only gives 2 GB. Both Sugarsync and dropbox allow you to increase your free storage by sending referral links to your friends. However, Dropbox puts a cap onto the space you can acquire this way. You can earn upto 16 GB of free storage by inviting friends to Dropbox. On the other hand, Sugar Sync has no cap on the amount of free storage a person can earn through the referral system. Sugar sync allows you to sync any folder on your computer. Unlike Dropbox, it doesn’t limit you to one folder only. You can sync any folder that you want without having to drag them to a special place or folder. Thus Sugar Sync has a lot more to offer when it comes to accessing files on the go. The same is the case when it comes to backing up the data. The ironic bit is that Sugar sync can even backup your dropbox folder. 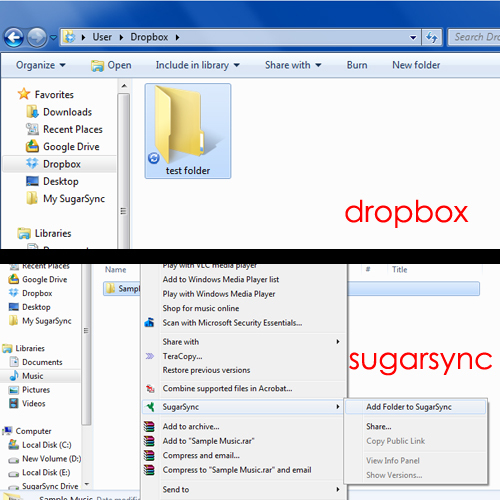 Simply right click on your dropbox folder, go to sugar sync and select the add folder to sugarsync. This makes switching to sugar sync very easy for the current dropbox users. As far as on the go part is concerned, both Sugar Sync and Dropbox have it well covered. Both offer free mobile apps to sync iPhone, iPad, Blackberry, Symbian and Android. This allows the users to access their files and photos while they are on the go. Dropbox offers packrat which allows you unlimited undo history for $39 a year. This means that you can undelete the files that you deleted and can also view their previous versions. Sugarsync offers file recovery by saving the last 5 versions of all your documents. Only the most recent version of each of your file counts towards your storage limit. This feature is in all Sugarsync accounts, even the free ones, by default. Next, we will take a look at the pricing. Sugarsync and dropbox offer pretty much the same amount of storage for the same price. 100 gb for 99$ a year. In sugarsync, however, you can start off with a low storage account while Dropbox allows a higher cap one for a personal user. 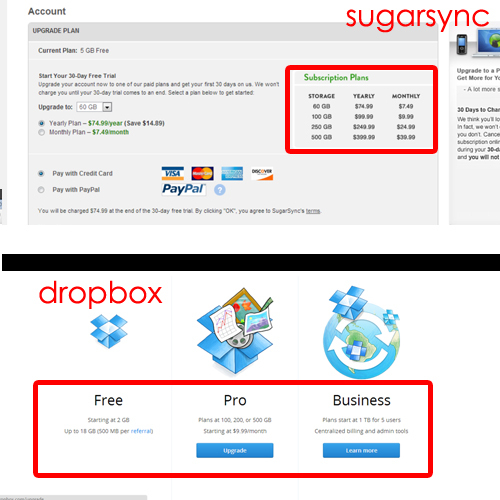 As far as the business pricing is concerned, sugar sync is a clear winner when compared with dropbox. For $550 a year, it allows a 3 member team while Dropbox allows one team member for $795 a year. With the low pricing and excellent backup features that sugar sync has to offer, it surely is going to give Dropbox a tough time.